“Throw out and keep throwing out.” Eugenia Errazuriz. I have been very inspired lately by these words pronounced by Eugenia Huici de Errazuriz (1860-1951) as I tackled yet another, small, move which, however, generated 9 boxes of stuff to find place for in my already full flat. I generally have my own law about possessions and that is: anything that comes into my home, means something else has to go out. Accumulating makes me claustrophobic, I do not collect anything and even though I have worked in the business of the visual arts for decades, I have nothing hanging on the walls. Bare white walls give me peace and make me feel serene and grounded . I was very grateful to my friend Maca Huneeus for refreshing my mind and inspiring me to write about the unique Eugenia Errazuriz. This came at the most appropriate time and just as I was contemplating the pile of boxes sitting in the middle of my living room for the last 3 days wondering how to put all that those things away. Like a mantra I kept repeating to myself : “Throw out and keep throwing out, ” one of Eugenia’s many priceless quotes, and throw out or give away I did . Born in 1860 in Bolivia, Eugenia Huici moved to Chile in 1865 . Over her lifetime she would have an extraordinary influence in Europe in art , literature, music and interior design as both muse and patron. Married to José Tomás Errazuriz, diplomat and paintor son of a wealthy mining dynasty and both of them coming from traditional families, they were to lead a most unconventional and untraditional life. Eugenia and José Tomás had a passion for European culture and moved to Paris in 1882. 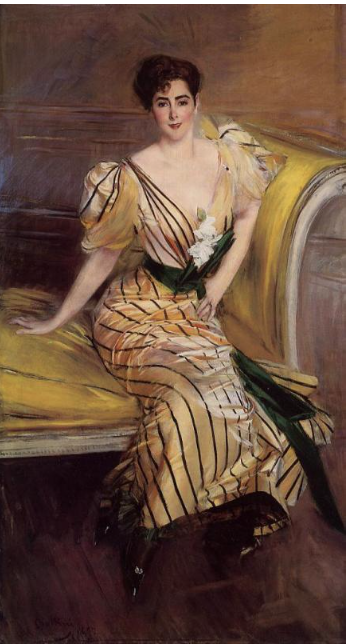 A vivacious and beautiful woman, she was painted by Jaques Emile Blanche, John Singer Sargent, Boldini, Chartran, Hellen, Madrazo, Conder and Picasso, who painted her over the course of their 30 year long friendship a total of 24 times. 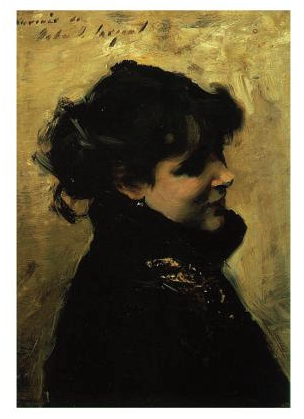 After Sargent met Eugenia in Venice in 1880, he wrote to his friend, the pianist Artur Rubinstein:” I have never known anyone with the unfailing uncanny taste of this woman. 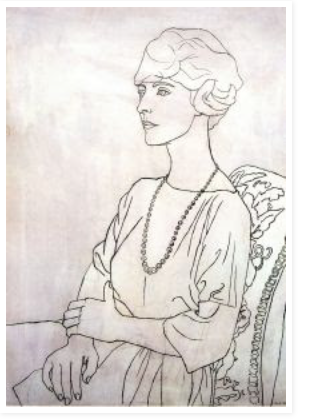 Whether in art, music, literature or interior decoration, she see , hears, feels, smells the real value, the real beauty.” Such was the attention she paid to detail that during World War I she commissioned Picasso to create cardboard cut-outs of cubist design for the glass pane blackouts. Artur Rubinstein describes his first visit to her new apartment on the avenue Montaigne in 1918: Eugenia had a new apartment on the Avenue Montaigne. 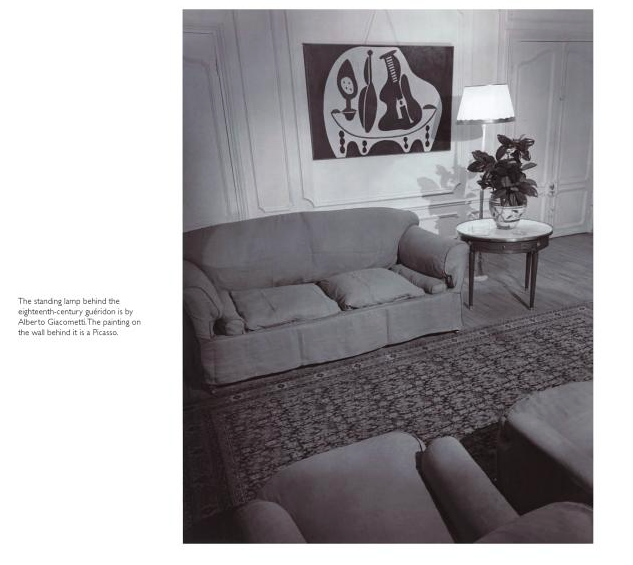 The drawing room had nothing but 2 pictures by Picasso , a portrait of her daughter and a wonderful landscape. She showed me with pride her chairs. “Ah ! Ah ! ” She said, “beautiful chairs. These are the chairs one hires in the Bois De Boulogne and I was lucky to be able to buy them. ” The simple iron garden chairs, which were said to have been taken from the Bois De Boulogne by Jean Cocteau and his friends and sold to Eugenia, were to be much interpreted from then on by the leading designers of that time, from Giacometti and Jean Michel Frank to Poillerat, Du Planter, René Prou, Drouet and others. 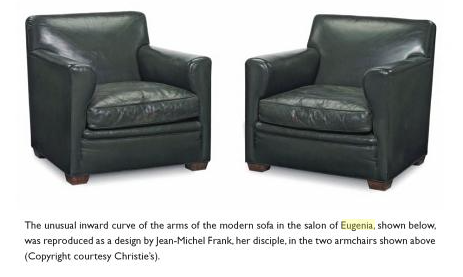 So this is how Eugenia launched a vogue for integrating iron garden furniture into upper-class interiors. The rudimentary original models of public gardens tables and chairs would emerge in the most elegant classic modernist forms. From then on iron became extremely fashionable. 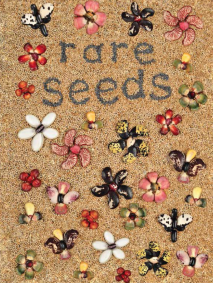 Eugenia did have a unique sense of color. Through her, the couturier Elsa Schiaparelli would capture the fashion world’s admiration with her “Shocking Pink. ” It was, in fact, a traditional luminous pink dye used on leather in her native Chil , a sample of which Eugenia had brought with her and shown to Schiaparelli. Above : Eugenia by Picasso 1918 . 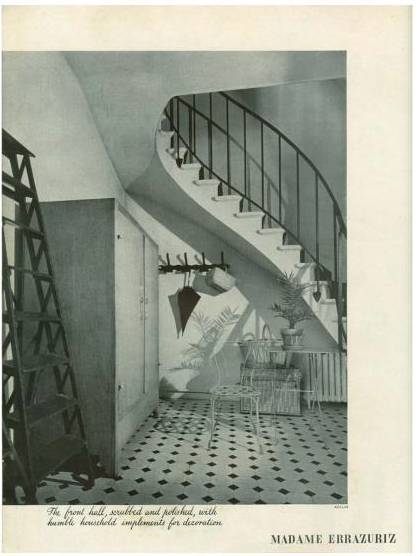 Below : Eugenia’s home on the Avenue Montaigne , Paris, as photographed by Kollar for Harper’s Bazaar USA in 1938. 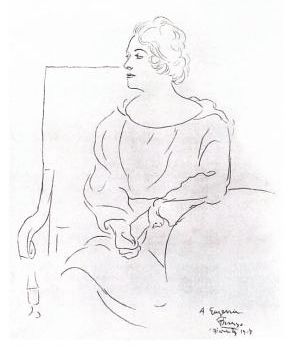 Of Eugenia one can say that she inspired all sorts of artists such as Augustus Johns, Braque, Diaghilev, Cocteau, Stravinsky, Cendars, Le Corbusier and Proust. She was already in her 50’s when she met Picasso in 1915 and was an avant- garde before him. During their long friendship Eugenia was always there for him, understood him, and bought his early works when he most needed. Introducing him to Rosenberg and Wildenstein, she created his clientele and laid the foundation on which Picasso could build his art into the biggest market forces of the twentieth century. 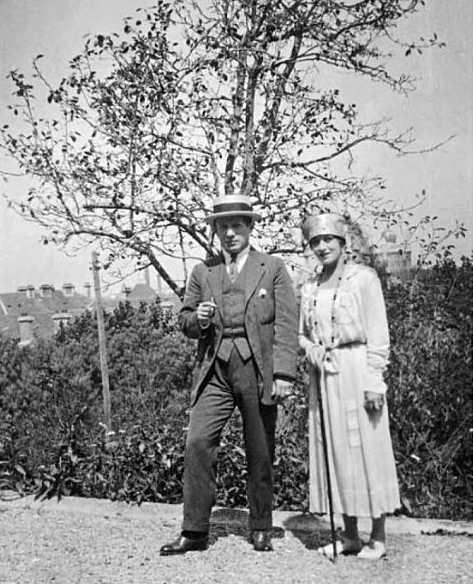 Apart from collecting and supporting his work Eugenia also had the vision to introduce him to Diaghilev in order to engage him in the art of theatre decors and costumes which resulted, amongst other collaboration , in the sets for the piece Parade interpreted by the Ballets Russes . 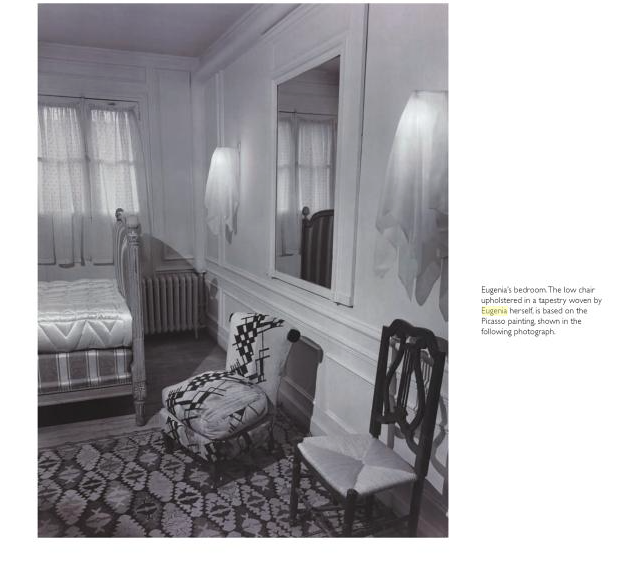 Eugenia had introduced the world to white walls stripped of floral plaster moldings 80 years before the word simplicity becomes synonymous of fashionable living. 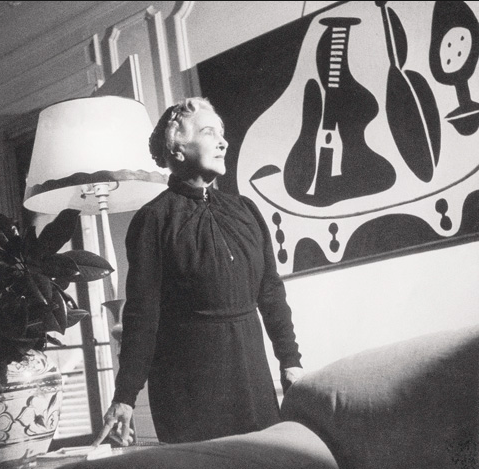 When in 1918 Picasso went to La Mimoserai , Eugenia’s home in Biarritz , on his honeymoon with Olga Khokhlova, he was impressed and influenced by the beauty of simple things , chosen and arranged by his hostess and the unaffected daring she brought to interior design . Rejecting the over-ornate pomposity of the turn of the century style Eugenia utters her now famous words: “Elegance means elimination.” And therefore white walls, bare wooden floors, sparse furniture were to become her signature . 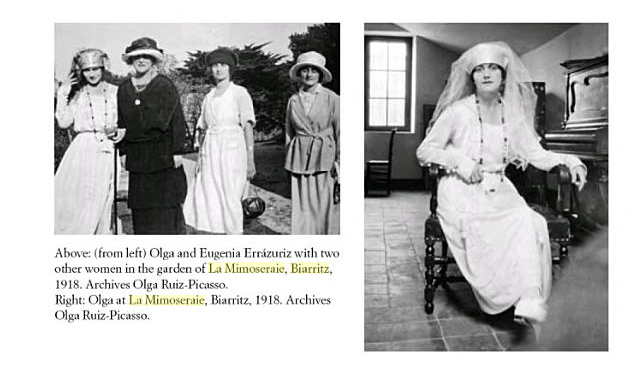 John Richardson writes in his wonderful book A Life Of Picass : The Triumphant Years , 1917-1932 , Volume 3 : ” Over the next few year Eugenia would transform La Mimoseraie into a house of monastic simplicity – whitewashed walls and terracota tiles. 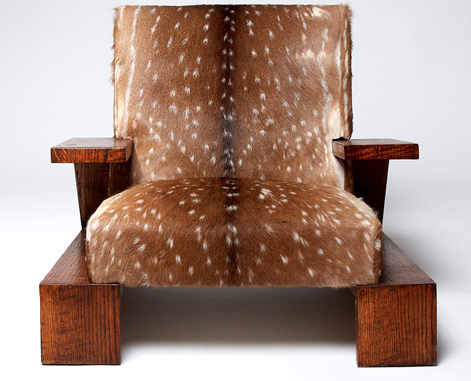 A minimalist fifty years ahead of her time , Eugenia had thrown out everything except a few armchairs. Her innovations would shock her hidebound neighbors , who lived in elaborate villas filled with fake dix-huitieme furniture and ormolu bric-á-brac, as much as it delighted her progressive friends. 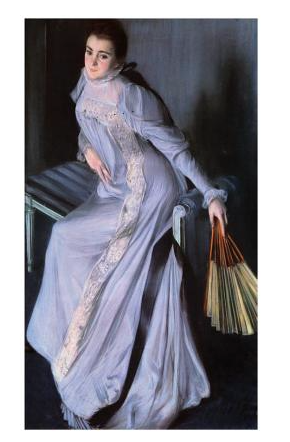 “The self-denial, even mortification, in Eugenia’s minimalism reflected her resolutely austere taste in art and decoration, as well as her Spanish piety. She did not see herself as a Maecenas or a muse so much as a secret sharer in her protégés sacrosanct work. If she provided her geniuses -Picasso, Stravinsky, Blaise Cendrars (and later le Corbusier ) – with financial aid and tobacco , she did so in the spirit of almsgiving. The hallway of Eugenia Errazuriz’s Paris home . Eugenia’s concept of a long wooden shelf as a simple substitute for heavy sideboards and serving tables of that time inspired designers and decorators from Jean Michel Frank to Jean Prouvé to create wall-mounted shelves , consoles and desks . 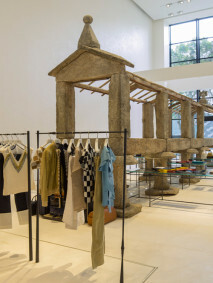 Eugenia took Jean-Michel Frank under her wing during his formative years, showing him how Louis XVI furniture could be reinterpreted in a modern way. Frank would subsequently create through his design company COMTE classic rustic modernist designs for the legendary Patagonia Llao Llao Hotel . 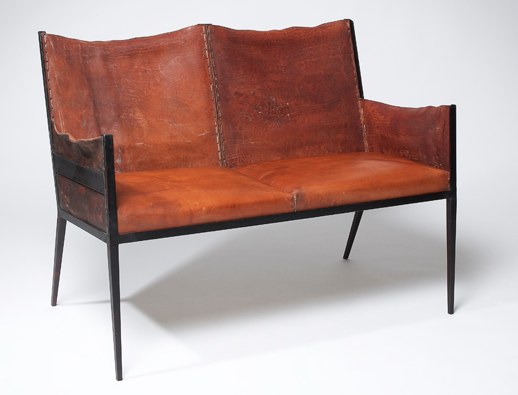 By 1937, Comte was producing his designs locally, and soon Frank was designing pieces (like a striking oak lounge chair with doe-hide upholstery photographed below) specifically for Argentinian projects like the above mentioned Llao Llao Hotel in the photograph below, or the sumptuous Born house in Buenos Aires, the library of which was lined in Hermès leather, and which had a three-panel screen by Salvador Dalí and lighting by Alberto Giacometti. 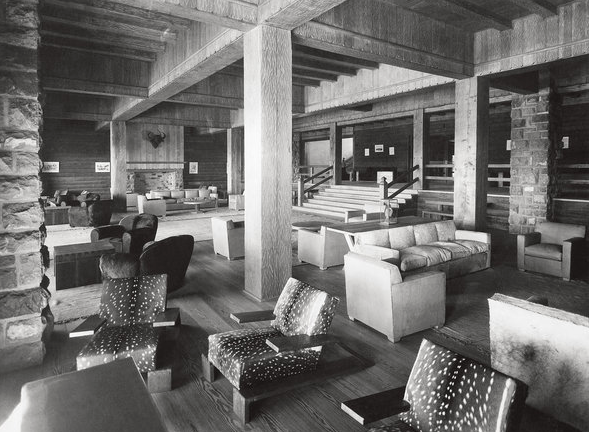 The Llao Llao Hotel in Patagonia, 1937 and 2 pieces by JM Frank for COMTE . 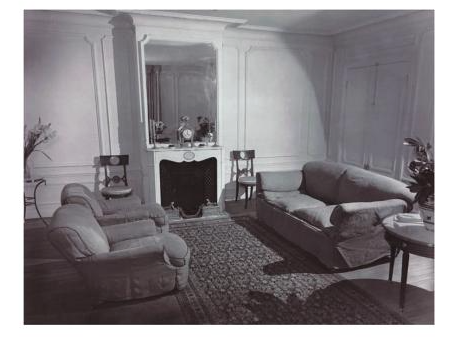 Interior designer Jean Michel Frank said: “Everything I know (more of less) I owe to her.” Eugenia’s unique, instinctive , minimalist vision and love of the lines and proportions of Louis XVI furniture would inspire the entire career of the young modernist . In February 1938 , 17 years after they met, Frank would write about Errazuriz for Harper’s Bazaar USA : “Her influence is indisputable. In a salon of Madame Errazuriz -whether it is her little house in Paris or her villa in Biarritz – the walls are always painted white. The floor is scrubbed with soap and water. There is a comfortable sofa and big armchairs , some pieces of severe Louis XVI with beautiful architectural lines. On the walls always one Picasso or more. At night , a very clear light to accent the neatness. “The worth of a belonging has no interest for her. On a valuable table one finds-and how many need to learn this lesson – a simple wicker basket. “If the kitchen is not as well kept as the salon,” she says,”if there are masses of old things lying around the bureau drawers, you can’t have a beautiful house. Throw out and keep throwing out. Elegance means elimination.” Jean Michel Frank . Lesson one : Remember the purity of line and proportion of late 18 th century furniture. Lesson three : Do not forget the comfort of English furniture , specially the armchairs of London’s gentleman’s clubs. She housed the objects she cherished in two large red lacquer cupboards. She used unlined blue and white striped curtains with classic French furniture, house plants had to be aromatic – rose geranium, lemon verbena, lavender, jasmine-all in terra cotta pots- another often -seen detail in design today. “Everything in Aunt Eugenia’s house smelled so good.” (Eugenia’s great niece Patricia). It was reported that the towels smelled of lavender, and that she washed her hair in rainwater. “To have an expensive ashtray on a table was, for her, as vulgar as putting out a saucer with a large cheque upon it: a plain piece of glass was all that was needed.” Cecil Beaton. Glass Of Fashion 1954. Eugenia Errazuriz at home in front of a painting by Picasso . Behind her a lamp designed by Alberto Giacometti for Jean Michel Frank. Eugenia by Jacques Emile Blanche 1890. 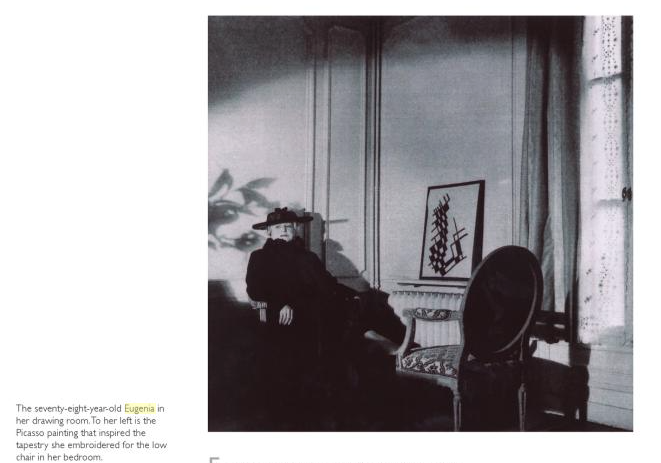 In 1935 Cecil Beaton wrote about his visit to the lodge-house in which she now lived in Paris, lent to her by her old friends, the Comte and Comtesse De Beaumont: Madame Errazuriz is now a very old woman…we sauntered through rooms furnished with the same stark taste that characterizes Picasso and Gertrude Stein. The floors are polished and bare , furniture is bold…..Panelled walls have been painted a French grey. A bunch of tightly packed peonies in a glass goblet on a brass table should have been painted by Monet. The curtains were made of sprigged white muslim. Huge abstract paintings by Picasso hung on the walls….Mme Errazuriz’s lodge- house is small, simple and in no way spectacular. But for those who can recognize such things, the taste is the height of luxury. This woman’s surroundings have reflected the same uncompromising and sophisticated sparseness…..that startled fin de siécle eyes and made Picasso realize he had found a kindred spirit . I am not surprised that later in life she became a lay nun since both Eugenia and her husband José Tomás were known for being generous and charitable. In 1926 , a year before he died in Switzerland, José Tomás sent all his art works back to Chile to be auctioned and the proceeds distributed amongst the dispossessed. Eugenia herself would always share her last cent with any needy artist, poet or musician, and on religious occasions would wear a simple black shift designed by Chanel. In the last years of her life she also commissioned Le Corbusier to redesign her Chilean beach house, but never went ahead with the project. Qué buena entrada! Leí el primer comentario de una descendiente directa de ella. Yo solo puedo decir que mi era tía de mi bisabuela (también Huici), quien siempre nos contó de esta tía mecenas de Picasso y no le creíamos, hasta un par de años después de que murió y salió un artículo en una revista sobre Eugenia. Existe un libro, “Le mécénat de Madame Errázuriz, por si te interesa! buscaré el libro…..que interesante ! I love this article. She was my dad’s grandmother, I have pictures of her and books sign by her. My husband and I visit Biarritz and it was amazing! Wow ! how brilliant Magdalena ! I was friends with Canuto ( Eugenio) and Fina Errazuriz when they were living and working in Sotogrande , Andalucia, in the 70’s . Actually they were friends of my parents but since I loved horses and polo , I was very close to them because he was the director of the Sotogrande Polo Club . How lucky that you were able to go to La Mimoseraie ….what a talented and inspiring family ! Thank you for leaving your comment ! i send you al the details. Fantastic article! Have bookmarked for future reference. I really enjoy reading about those people who influenced style and this is a lady I had not come across before. Thank you for writing this. Increible mujer, ejemplo de elegancia y buen gusto innato.